Rules of the road for motorcycles are fairly consistent from State to State. Driving defensively is always key, including anticipating how and what might occur. Motorcyclists must drive staggered when driving together is an example of one rule. Other rules include wearing helmets and proper safety gear, and maintaining a motorcycle license. From a personal injury perspective, driving within the rules will help avoid accidents, but obviously does not guarantee someone else will not be careless. One of our first defective maintenance cases came in our early years of practice. The subject motorcycle was assembled at the shop prior to being put out on the showroom. A buyer purchased the dirt bike and went on a maiden ride in the desert. On the first bump the handlebars collapsed causing the rider to roll over the bike and sustained a major back injury. In litigation we discovered the bike was not torqued to specifications, and in fact, was completely not checked prior to putting on the show room floor. Defective maintenance is a major issue to motorcycle riders if the maintenance causes the crash. Examples of this include: brake lines; tire connections, unfastened brake cables, and old tires. Both partners at Benson and Bingham ride motorcycles and understand the issues that riders confront. Call us today for a free consultation. The #1 cause of motorcycle accidents in Nevada and around the country continues to be car drivers who pull out in front of motorcyclists. There is no time to react and the situation is usually catastrophic. Helmets and head protection may offer little overall protection given the forces involved. The typical scenario is the"superman" departure from the bike. Often the impact is so severe it literally can take the helmet off of the driver unless it is fastened extremely tight on a DOT helmet. Proactive measures can be taken to avoid collisions if enough time has elapsed for the motorcycle driver to make an evasive move. Usually this means a "lay down" of the bike where ankle and leg injuries tend to increase in risk percentage. As avid riders, both partners understand the risks and situations that bikers face and therefore make better motorcycle attorneys. Call us today. 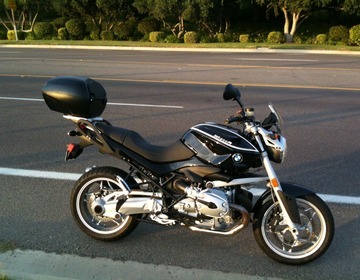 Mr. Benson has both an R1200R BMW urban street bike and a Harley Davidson V-Rod Muscle. Mr. Bingham rides a Triumph Café Racer and a Triumph Speed triple. Mr. Bingham currently purchased a custom built bike with the award winning LA Speed Shop. Minimum coverage in Nevada for a motorcycle is $15,000 for liability protection. Too often, we find that drivers fail to adequately protect themselves and fail to purchase UM/UIM coverage. This is a MUST coverage for riders. Cheap UM/UIM coverage, because of the risks, is hard to find. Most insurance companies will only sell up to $500,000.00 in UM coverage; this includes progressive, USAA, and Geico who are the bigger motorcycle insurance carriers. Sadly, many clients come to our office with little or no uninsured motorists coverage or underinsurance coverage, and they find out that, after an accident, the person who caused the accident only has $15,000 or worse, no coverage. This is extremely problematic if the injuries are significant. Most riders also lack health insurance, which compounds the problems- they are injured with no medical or financial help. If you have a question and would like to speak with our motorcycle accident lawyers, call Joseph L. Benson II, Esq. or Ben Bingham Esq. Both attorneys who are both experienced riders and understand the risk of motorcycles. Motorcycle injuries are often very severe if the victim survives. Motorcycle accidents, by their very nature, cause a variety of injuries. Those injuries range from broken bones to brain injury. Our firm has handled the gambit of injuries. Broken forearms to severe brain damage cases all deserve major attention. Helmet laws and helmet use have increased over the years, but it has not decreased the injuries to extremities. Broken legs, ankle and knees are very common in side-impact cases. Road rash is also a very common motorcycle injury. If you have major motorcycle injuries, it is imperative that you get the necessary treatment you deserve. If you do not have health insurance, we can get you into orthopedic doctors and other specialists with just a phone call. Do not worry about your medical expenses, call Benson & Bingham today. Motorcycle passengers are always fault free in accidents. Passengers may have to make claims against the drivers they are riding with if the driver was negligent. Insurance coverage is often limited in motorcycle accidents and it is important to inspect all avenues of income sources to make sure passengers and motorcyclists are made financially whole. No other vehicle is more prone or susceptible to damage then a riding a motorbike. Stopped at a light and relaxed, when all of a sudden a driver fails to stop and instantly deadly ramifications can occur. While not the most common type of accident on a bike, rear-ends cause riders to exist the bike in unique directions because of the forces exerted. When drivers crash in a single vehicle event it usually means the driver of the motorcycle is at fault. This can be due to excessive speeds or loss of control as the bike "got away." Unfortunately, these types of crashes are not collectible as Nevada is a fault based system, and those drivers are out of luck when. When motorcyclists are forced off the road because they have implemented a defensive driving a maneuver it evokes Nevada's phantom vehicle rule. The phantom vehicle rule requires some type of physical damage to the bike or evidence of a collision. The theory is that all single car accidents would simply claim, "Someone ran me off the road." This rule can be especially harsh to Motorcyclists who are run off the road. If eyewitness accounts were available, then we no longer have a phantom vehicle. If you have this scenario or an accident similar call the experienced motorcycle attorneys at Benson & Bingham for a free consultation. 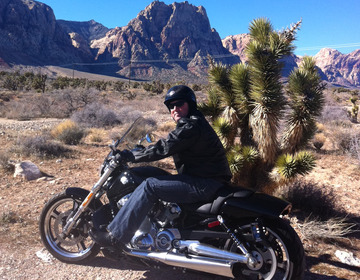 Race equipped street bikes frequently travel the red rock canyon and the outskirts of Las Vegas, as the roads are very conducive to higher speed riding. Breaking the law, of course, is not condoned, nor encouraged, but high speed motorcycling is a reality. Those who choose this dangerous activity usually wear protective gear: leather, gloves, boots, helmets, and added padding. Racing a motorcycle, even alone, creates a very dangerous and scary scenario.